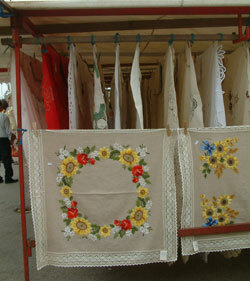 The Maltese manufacture some very beautiful tablecloths with intricate hand-embellished embroidery or lace. You will see them offered for sale in markets and shops and they do make very nice souvenirs or presents except that they are fairly expensive. The price in markets is negotiable so do haggle. It's often not until you start to walk away that the best price is offered. In this day and age of textile exports from the far east it is difficult to compete on price but if you would like something special to remember your Maltese holiday by then a tablecloth may be the best buy for you. Alternatively, there are aprons (like granny used to wear) and smaller but equally pretty table centrepieces. Crochet is another craft the Maltese do well (we know what the women do when the men are setting the world to rights down at the pub/coffee shop in the evening). Some tablecloths have crochet trims or inserts but you will also find place mats, elegant crochet handbags and items of clothing. Craft centres are good places to shop for high quality Maltese handcrafted goods. There are also souvenir shops in Valletta that stock Maltese handicrafts.